Adeleke pictured after her victory on Saturday. 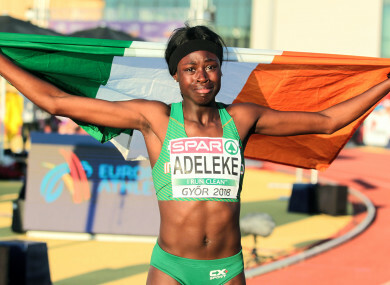 THERE WAS MORE success for Ireland at the European U18s Championships on Saturday evening, as Rhasidat Adeleke secured a gold medal in the 200m final. The 15-year-old stormed to a resounding 23.53 victory in Hungary, shedding tears afterwards following her success. “I can’t believe it,” the teenager said. “It’s just so surreal, I just tried my best to keep my form, because I know when I’m under pressure I start to lose my form and slow down. The Dubliner’s success was Ireland’s fourth medal at the European Championships. Sarah Healy claimed gold in yesterday’s 3000m, adding to Gina Akpe-Moses’ silver in the 100m and Molly Scott’s bronze in the 100m hurdles two years ago. Email “15-year-old Rhasidat Adeleke storms to 200m gold for Ireland at European Championships”. Feedback on “15-year-old Rhasidat Adeleke storms to 200m gold for Ireland at European Championships”.